As you may or may not know the skeleton case that comes with the go pro is mostly BB proof apart from the lens. I've been looking for a lens cover for the case which is BB proof but I have come up with Zilch! Does anyone out there know where I can get one? It still takes a lot of force to break the lens cover of the case, and then likely not to reach the camera - theres a few on youtube of 2.5J rifles hitting them under 5m and not damaging the camera. The cases are only £35 real, £15 fake, perhaps just wait until something breaks the cover? Anything you buy will do significant effect to the picture quality and these things have been dropped out of aircraft without harm. Done my own tests and a standard rifle will go through the lens cover. The rest of the housing is sturdy enough it's the lens cover thats the weak point. Found brain exploder PT. Thanks! Aye, but did it damage the camera - that's all the matters. surely if it smashes the cover it makes the go-pro unusable until it is repaired so really, it isn't all that matters. 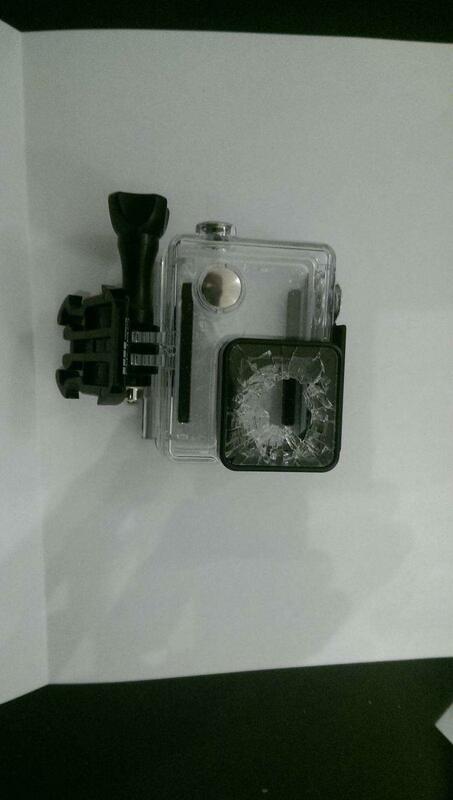 I've never heard of any part of a gopro case breaking in airsoft - other than on youtube. Yes, I suppose so. I just figured if he could afford to spare a case for his test - a test for something which 'might happen', he might be better off with the solution I have adopted. But PT247, I have here compared the OP to myself, in that I have erred. All the evidence on youtube indicates that the gopro will survive a 2.5J hit to the lens from under 10m. Though the shell was destroyed in all instances. Thus, I have two cases and don't worry about it till it happens. If it's the HERO 1 then go right ahead. So much Grammar fails here. Yeah I'm not risking it the camera is hundreds of pounds and the case is only around £30 so of course I done my own tests to be sure. I'll post up a pic of the carnage that was left behind after my test on the lens cover when I get in front of a PC. Oh wait I can do it now. Here you go. What did you do to it, at least tell us you did something which could really happen? That damage looks like you exposed the lens to conditions which would never occur in airsoft. I find it simply impossible to believe that damage was done by a single BB in realistic circumstances - lets say travelling 1.2J from a distance greater than 5 metres. We regularly get shot under 5m of course, but I've no recollection of ever being shot in the face under 5m by anything other than a gas pistol. *if you're not mounting it on your head then ignore me. The test was a point blank shot for a 1.2j shot from my rifle. I'm planning to head mount it and yes I've been shot in the face many a times at cqb sites. Probably because I like poking my head out lol. Ah, thanks for the reply. Did you consider doing a test from a little further away first? The way the gopro is designed, I wouldn't be at all surprised if the lens cover is weaker with nothing behind it. Notice how the fracture pattern is only around the circle? If you had a camera in there it probably would not have sustained any damage because there is nowhere for the lens material to go inside the housing. I doubt the lens breaking inwards would destroy the camera - but that would be the real test. I don't mean to be rude, but your test is kind of meaningless since the gopro case lens in a real world situation is not going to have a circular hole in the surface immediately behind it. I would suggest you repeat the test in the corners of the gopro case lens in the picture above on the corners of the one you've already broken. Very interesting that the lens is so tough! How easy is it to replace the lens though if it gets hit and scratches?